Last week we opened our latest exhibition at Buxton Museum and Art Gallery, ‘Revealing the World’. The exhibition looks at the curios and artefacts brought back by travellers, scientists and explorers who travelled the world. The exhibition includes loans from the British Museum, Derby Museum Service and Bakewell Old House Museum, and includes some of our Enlightenment! purchases. Other items were donated by Enlightenment figures with Derbyshire links such as Joseph Banks and Thomas Bateman. On display there is an oil painting called ‘Near Tokyo’ by Frank Beresford that Derby Museum and Art Gallery bought from Ebay earlier this year. Frank Beresford was born in Derby in 1881 and trained at the Derby School of Art. 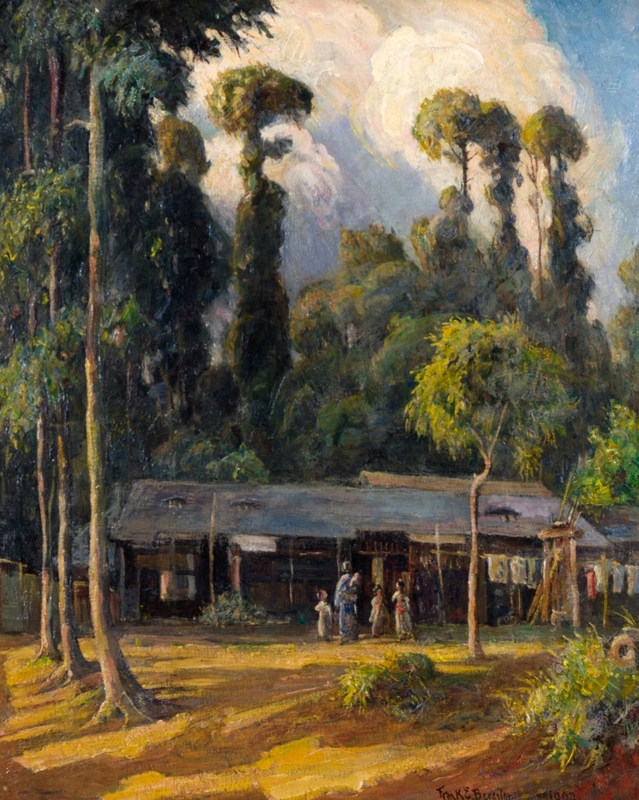 In 1908 – 1909 he went to Japan on a painting tour, you can find out more about the artist and his visit to Japan here. The other two loans from Derby Museum Service look at how far-away places influenced fashions and designs back home. On display are the two Derby Porcelain plates that the project bought in 2009. The plates painted by John Brewer show Arctic scenes including a Newfoundland dog rescuing a sailor and a rather docile looking Polar Bear. Their production shows the level of interest in the Arctic explorations that were happening at the time. Another loan from Derby is a mettzotint of Joseph Wright’s painting ‘The Widow of an Indian Chief Watching the Arms of her deceased husband’ – showing the fascination there was for the image of the ‘Nobile Savage’ in late 18th century Britain. Other loans include a pyramidion collected and donated to the British Museum by Sir John Wilkinson Gardner, an Aleut Indian canoe donated by Joseph Banks and three Peruvian figures collected by Thomas Bateman. The exhibition is free and runs until the 24th November.